A Suit That Fits: What Cloth to Choose for your Groom’s Suit? Following their previous blogs on how to personalise small details for your groom, and their guide to finding your perfect wedding suit, bespoke tailoring company A Suit That Fits are back again to give you a few hints and tips on how to know what cloth to choose for your Groom’s suit! The next thing to think about is his style and the style of your wedding – this will dictate the colour and pattern of the suit; if you’re going for simple elegance, a plain cloth in a quality fabric (perhaps with a silk blend) is the order of the day. If you’re going for something a little different, why not choose a cloth with a subtle check? If he’s opting for a traditional morning suit, he’ll have to wear a black or navy morning coat, grey trousers and a light waistcoat. If you’re heading to sunny shores for your wedding, he might get a little hot under the collar – so linen’s a good choice. It’s possible to get hold of linens that are slightly heavier (so they don’t crease easily) and are available in a range of colours (not just the light, sandy colours to associate with linen). However, lighter colours will keep him cooler – so take a look at lighter tones which won’t attract the sun quite as much! Heavier wools will keep him cool if you’re having a romantic winter ceremony. Any heavy wool blend (such as herringbone) will work – and if he’s feeling a little adventurous, why not try tweed? The tone of the cloth will also need to compliment his complexion; for example, pale cloths work better on fair skin tones where dark colours may wash the complexion out. Light grey is the wedding suit staple, it compliments more complexions than any other colour, provides great contrast for the wedding colour scheme, and compliments almost any bridal gown colour. Charcoal grey is more formal and a very smart option. The lighter coloured fleck in the cloth such as is evident in mohair and flannel, soften the overall effect. Black is sophisticated but can be a little restricting when looking for accessories or complimenting most colour schemes. Bright colours show confidence; powder blue and dusk pink are popular; choose a colour that compliments your complexion, and be sure to accessorise with contrasting, more muted colours. 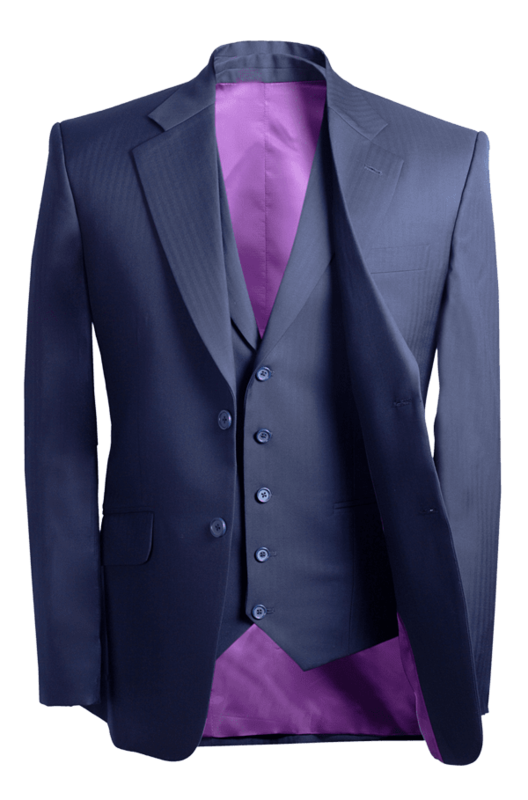 Navy Blue is a really popular colour for a wedding suit; silk navy suits or mohair navy suits being the most common. You may want some element of the suit to reflect the wedding’s colour scheme, so come to your initial consultation armed with the prerequisite colours. It is a popular choice to have the back of your waistcoat, and also your jacket lining match the colour scheme. We hope this has been helpful; if you need any more guidance, please visit www.aSuitThatFits.com, call 020 3006 7999 or book an appointment with an expert Style Advisor. Am writing you from Zambia. I love the Mohair suit with purple lining. My question is, where do I buy it and how much will it cost?